The Tequila Matchmaker app database currently contains a whopping 3,307 different tequilas coming from 1,680 brands. With so much selection available, which ones are most favored among tequila aficionados? The chart above shows the 20 tequilas that have collected the most “likes” from members of the app community, as of July 2015. Don Julio 1942, is the most popular tequila with 290 “likes.” Tequila Fortaleza, a small batch brand that crushes their agaves using a 2-ton tahona (stone wheel), is the 2nd and 3rd most popular tequila for their reposado and blanco varieties. 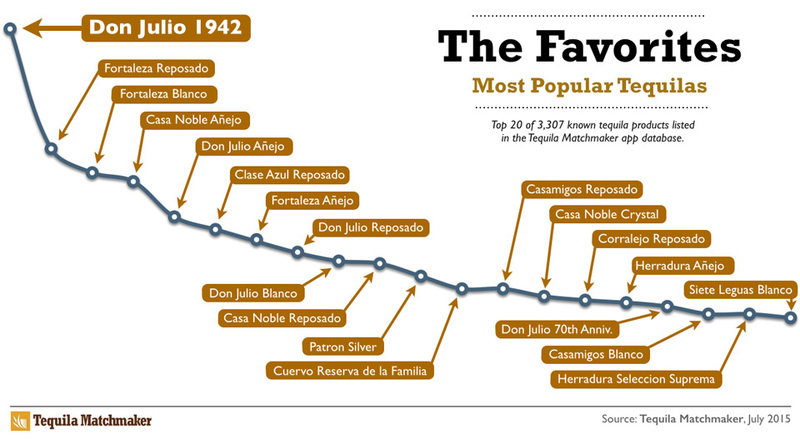 Casa Noble Añejo comes in at #4 with 169 likes. George Clooney’s “Casamigos” tequila also shows up high on the list. Casamigos Reposado is the 12th most-liked tequila, and Casamigos Blanco shared the #18 slot with Herradura Seleccion Suprema. Although tequilas that are more widely distributed get more likes, is it clear that Tequila Matchmaker users appreciate high quality products. If not, perhaps it made the Top 100 list below? Same here. I asked for their best sipping Tequila and we were served Amor Mio. Wow! My wife an I were both blown away. I expected a huge price tag, but they only charged us about $8USD per glass. First thing I did when I came back: Ordered a bottle! Great list here. It’s an excellent resource for when you’ve got a craving for a good tequila! Thanks so much for sharing this. I’m gonna have to try a couple of these myself. What are the chances that you folks would be interested in doing an update comparison for this list? Maintain these present existing lists and graphs, then compile the same info. currently. I would expect that it would be interesting to reflect possible shifts – it’s been a year and a half already, mas o menos! I’ve previously noticed interesting overlay or double graphs that were great for delineating changing values. What cha think? I believe that I have observed some significant price point shifting. Surprisingly a downward trend in pricing for some. Do not know if that is due to a reflection of: quality, demand, manufacturing changes, or chasing or positioning for a more advantageous position for market share? Also in the mix is of course the rather significant downward slide in value of the Peso vs. the Dollar, as well. I agree with you that an update for 2016 would be a worthwhile project for us. Once we find the time we can export the data once again, and then compare the changes. It seems the list is missing any items from Sauza. Sauza Hornitos is easy drinking, decent punch to it and has little afterburn. Says a Conmemorativo has a bit more pop to it and very drinkable too. Another new fave that is very smooth, lightly flavored and unheavy- handed is Don Julio Luxe. It is platinum or “cristalino” and is sippable. Good stuff all! !